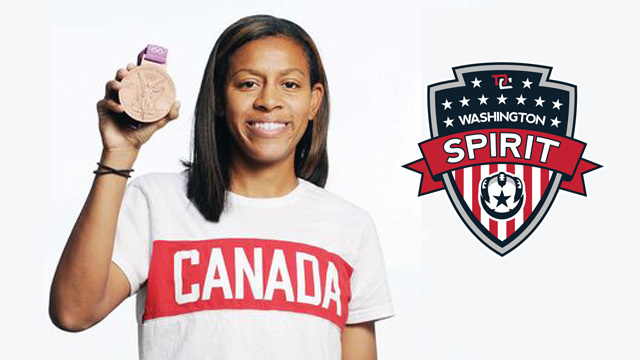 Boyds, MD (February 8, 2013) – The Washington Spirit announced today the signing of 29 year old Candace Chapman who was born in Trinidad and Tobago and grew up in Ajax, Ontario. The experienced central defender has been part of the Canadian Women’s National team since 2002, earning 108 total caps (5 goals), and was most recently part of the 2012 Canadian Women’s Olympic bronze medal team and Pan American Games gold medal team. Chapman comes to the Spirit with extensive women’s professional soccer success. She was on the 2010 WPS championship team FC Gold and the 2011 WPS championship team Western New York Flash. Prior to her professional career, she played in college at Notre Dame from 2001 – 2005. Preseason camp for the Spirit begins March 11, 2013 at the team’s Maryland SoccerPlex training facility. Head coach Mike Jorden will use several soon-to-be-announced exhibition matches during the training camp to assist in his final roster selection of no more than 20 players. The season opener will be either on April 13 or 14th, though it is not yet clear if that will be a home or away game. The NWSL season will run through the end of August 2013. The full schedule due to be announced any day. Additional Note: Chapman holds a U.S. Green Card, providing Permanent Resident status in the United States, so will not count against the Spirit’s international player limits.